1. Slice the garlic bread into slices approximately 2cm thick but don't cut all the way through to the bottom, stop just before the base of the roll. 2. Mix the butter, garlic, parsley, salt and pepper together. 3. Spread the garlic butter on each slice of bread. 4. Wrap the loaf in tinfoil and cook at 180°C for ten minutes. 5. 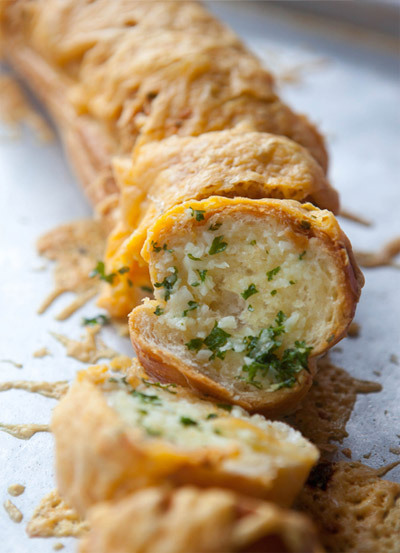 After 10 minutes, open up the tinfoil to expose the top of the garlic roll and sprinkle the cheese over. 6. Place the garlic bread back in the oven (still with the top of the loaf exposed) and allow the cheese to melt. This should take 5-7 minutes. 7. Take out and enjoy. If you prefer crispy cheese, place the loaf under the grill for 5 minutes.